Seychelles, officially the Republic of Seychelles ( pronounced /seɪˈʃɛl/ or /seɪˈʃɛlz/; French: République des Seychelles, pronounced /seʃɛl/; Creole: Repiblik Sesel), is an archipelago nation of 115 islands in the Indian Ocean, some 1,600 km east of mainland Africa, northeast of the island of Madagascar. Other nearby island countries and territories include Zanzibar to the north, Mauritius and Réunion to the south, Comoros and Mayotte to the southwest, and the Suvadives of the Maldives to the northeast. In terms of population, Seychelles is the smallest sovereign state of Africa. While Austronesian seafarers or Arab traders may have been the first to visit the uninhabited Seychelles, the first recorded sighting of them took place in 1505, by the Portuguese. As a transit point for trading between Africa and Asia, they were occasionally used by pirates until the French began to take control of the islands starting in 1756, naming them after Jean Moreau de Sechelles, the then French finance minister. The Seychelles president, who is both head of state and head of government, is elected by popular vote for a five-year term of office. The previous president, France Albert René, was democratically elected after the constitutional reforms of 1992, though he had been in power since a coup d'état in 1977. He stood down in 2004 in favour of his vice-president, James Michel. The cabinet is presided over and appointed by the president, subject to the approval of a majority of the legislature. The unicameral Seychellois parliament, the National Assembly or Assemblée Nationale, consists of 34 members, of whom 25 are elected directly by popular vote, while the remaining 9 seats are appointed proportionally according to the percentage of votes received by each party. All members serve five-year terms. 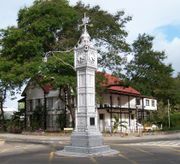 The famous clock tower in the centre of Victoria, capital of Seychelles. The Seychelles constitute an archipelago in the Indian Ocean of forty-one islands, of which thirty-three are inhabited. The group of islands around Mahé consist of granite and are the largest and most populated of the country. The remaining outer group consists of smaller coralline atolls. The capital city, Victoria, is situated on Mahé, which is the largest island and home to about 80% of the total population, as well as the Seychelles' highest point, the Morne Seychellois at 905 m.
Seychelles largely escaped the Asian Tsunami of December 2004 spawned by an earthquake. However, the islands did see significant flooding and damage, as well as the loss of marine life and a death toll of three people. Anse Lazio on Praslin, an island of the Seychelles. At the same time, the government has moved to reduce the dependence on tourism by promoting the development of farming, fishing, and small-scale manufacturing. The vulnerability of the tourist sector was illustrated by the sharp drop in 1991- 1992 due largely to the country's significantly overvalued exchange rate, the Gulf War and once again following the September 11, 2001 attacks on the U.S.. Other issues facing the government are the curbing of the budget deficit, including the containment of social welfare costs, and further privatisation of public enterprises. The government has a pervasive presence in economic activity, with public enterprises active in petroleum product distribution, insurance, banking, imports of basic products, telecommunications, and a wide range of other businesses. Growth slowed in 1998– 2001, due to sluggish tourist and tuna sectors. Also, tight controls on exchange rates and the scarcity of foreign exchange have impaired short-term economic prospects. The black market value of the Seychelles rupee is half the official exchange rate; without a devaluation of the currency the tourist sector should remain sluggish as tourists seek cheaper destinations such as nearby Comoros and Madagascar. A reduction in the number of flights serving the country, primarily due to the inability by airline companies to repatriate funds, has also constrained the growth of the tourism industry. The recent entry of Emirates and Qatar airlines has yet to result in increased growth. It is important to note that Seychelles is, per capita, the most highly indebted country in the world according to the World Bank, with total public debt around 122.8% of GDP. Approximately two thirds of this debt is owed domestically, with the balance due to multilaterals, bilaterals and commercial banks. The country is in arrears to most of its international creditors and has had to resort to pledged commercial debt to continue to be able to borrow. This high debt burden is a direct consequence of the overvalued exchange rate — in essence, the country is living beyond its means, and financing its lifestyle by borrowing domestically and internationally. The early colonial history of Seychelles is infamous for the disappearance of most of the giant tortoises from the granitic islands, felling of coastal and mid-level forests and extinction of species such as the Chesnut flanked white eye, the Seychelles parakeet and the saltwater crocodile. The Seychelles today is known for success stories in protecting its flora and fauna. Conservation started in the 1960's by a small group of local enthusiasts. Although many of the conservation laws date back to British colonial days, the Seychelles government has strictly protected the natural heritage of the islands for many years. Flagship species, the Seychelles Magpie Robin and the Seychelles Warbler, have been spectacularly rescued from the brink of extinction by BirdLife International, Nature Seychelles, Islands Conservation Society, private islands and the government. These birds, once restricted to one island each, have been translocated to many others. Seychelles has 12 endemic bird species including the Seychelles Flycatcher, Scops Owl, White Eye, Swiftlet, Kestrel, Blue Pigeon and Sunbird. Seychelles is home to 2 UNESCO World Heritage Sites run by the Seychelles Islands Foundation. They are the island of Aldabra, which is the world's largest raised coral atoll and also the Vallée de Mai on Praslin island, billed as the original site of the Garden of Eden. The Cousin Island Special Reserve, purchased by Royal Society for Nature Conservation in 1968 and managed by Nature Seychelles, is an internationally-known bird and marine sanctuary which has won several awards for conservation and ecotourism. Seychelles has six national marine parks including the St. Anne National Marine Park located adjacent to the capital, Port Victoria which are managed by the government parastatal, Marine Parks Authority. Much of the land territory (about 40%) and a substantial part of the coastal sea around Seychelles are protected as National Parks, including Marine Parks, and Reserves. Several private island owners, especially those with up market hotel resorts, have collaborated with the government and NGOs to restore island habitats and to re-introduce threatened species. These islands include Fregate, Denis and Cousine. The management of these islands now employ full time conservation officers and fund conservation programmes. The island restoration program has now been taken to the outer islands by the Island Conservation Society. The giant tortoises from Aldabra now populate many of the islands of the Seychelles. These unique reptiles can be found even in captive herds. The granitic islands of Seychelles supported distinct species of giant tortoises. Seychelles hosts some of the largest seabird colonies in the world. Islands such as Bird, Aride, Cousin, Aldabra and Cosmoledo host many species of seabirds including the Sooty Tern, Fairy Tern, White-tailed Tropicbird, Noddies and Frigatebirds. The marine life around the islands, especially the more remote coral islands, can be spectacular. More than 1000 species of fish have been recorded. Since the use of spearguns and dynamite for fishing was banned through efforts of local conservationists in the 1960's, the wildlife is unafraid of snorklers and divers. Coral bleaching in 1998 has unfortunately damaged most reefs. The taking of marine turtles was completely stopped in 1994, turtle populations are now recovering on several islands, most notably Cousin Island and Aldabra. The use of gill nets for shark fishing as well as the practice of shark finning are now banned.